Super simple, but loads of flavor. And so pretty. This was a nice change of pace, but it didn't do anything to enhance our perfectly ripe tomatoes. In the notes above the recipe, Mark Bittman says this is a good way to prepare winter grape tomatoes. I recommend saving this recipe for those (relatively tasteless morsels) and save your seasonal peak tomatoes for something better. 7-25-10 - Rave reviews! Served with fish tacos. Would go well with any barbeque. Definitely will make again... soon! Jon would like a different combination of spices on the fish. Thought it was too much chile powder, but when added to the taco filling, it toned it down. Delicious. I used cremini mushrooms and left the small ones whole and cut the larger ones into chunks. They shrunk quite a bit during cooking, so one pound of mushrooms made enough salad for only 2 people. I will definitely make this again. Added a little bit more vinegar than the recipe called for but then I do like vinegar a lot. If you look at the recipe and worry that the arugula is not dressed with any oil or vinegar (it all goes on the chickpeas), your concerns are well founded. It pretty much tasted like dry arugula interrupted by an overwhelming quantity of raw onions. Even when I added some olive oil to the greens, it was not good. The toasted corn and black beans really do work well together, although I would have been happier if I had cooked the black beans a little more. Adding avocado and mild Danish feta made it a great meal inside warm flour tortillas. The amount of lime juice needs to be adjusted to suit taste and the acidity of the limes. We halved the recipe and it made too much for two people. A simple,to make dish - we ate it with sausages and green salad, but it would be good as part of a mixed salad plate, as the lentils are quite satisfying. It was best a day or two after making. This a perfectly simple and perfectly delicious recipe for our lemon-loving family. So rich and creamy tasting, it's astonishing that it's made with just yogurt and a bit of oil. Curious now to try the barley version. Used picholine olives instead of black and didn't use the full amount of fresh herbs, and it was definitely lacking. But played with leftovers — pleasant with other things for lunch. Although this recipe is actually for a soup, I've never made it that far. The glazed carrots themselves are far too addictive and delicious to carry on with the extra steps of simmering and pureeing. Made this for dinner... added a poblano pepper, corn and a splash of soy. In true Mark Bittman style, this recipe is the perfect base to make into whatever you are in the mood for. I would definately use this recipe again as a blank canvas to create a master piece out of. The paprika called for here should be smoked. for the cream of tomato soup, used homemade almond milk (and olive oil) to keep it vegan - still was really good. immersion blender didn't really work - ended up sending through a fool mill (the soup was really smooth but left with a lot of "stuff" in the mill -- might try the blender next time). Great soup with rich bean flavor using Rancho Gordo “Midnight“ black beans and bean cooking liquid instead of vegetable broth or water. Used approximation of Mark Bittman’s chili powder recipe from same cookbook, using ground spices. Served with lime juice on the side, instead of mixed in. Great soup with Rancho Gordo “Midnight” black beans and bean cooking broth instead of vegetable broth or water. Delicious. Great way to welcome the opening of the farmers market season in the Midwest. A small bunch of sorrel (~ 1/4 lb) is sufficient for this recipe. Didn't have time to make vegetable broth from scratch, so I just used one vegetable bouillon cube. Serve with some good bread, and this is a hearty dinner. my family was indifferent to negative about this soup. It was super boring. We pureed this when I hurt my jaw and it was quite good and filling due to the rice and tofu. I'm very curious to try this as written. My favorite gazpacho. I don’t use as much cucumber as listed (personal preference). I made this recipe from a recent NY Times Magazine, but it is the same as in the book. It is really delicious and easy. It has what I consider to be the occasional Bittman magic, where some rather simple and routine-seeming ingredients somehow combine deliciously -- in this case, the secret lies in the way the hard-cooked eggs blend with the curry to create interesting texture and flavor. 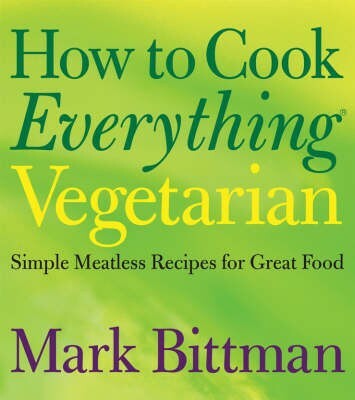 I am not a huge Bittman fan, but he does hit it out of the park sometimes. I made the vegan version of the Everyday Pancake with walnut flour & they were fantastic. Cute and puffy little pancakes. It's a bit difficult to know when they have cooked through, as they retain some sponginess due to the whipped egg whites. I made the lemon poppyseed variation, which didn't taste particularly lemony but had a fun combination of textures. A little under salted -- will use a more generous "dash" next time. Lemon flavor doesn't come through very strongly, but the crunch of the poppy seeds in the fluffy pancakes is quite nice. Really wonderful. I made the version with sweet potato instead of pumpkin and it had a subtle, delicate flavor. I made the cream cheese with neufchâtel to lighten it up. With that plus a drizzle of maple syrup, a sprinkle of pumpkin pie spice, and some crushed pecans: big level up on ordinary Sunday waffles. This guacamole is worth the extra effort. Fantastic and a bit unusual. Even my non-veggie eater loves this. This one was a disappointment, especially because I love the idea of nut butters and veg together... The pistachio butter was bland, and I wonder if a neutral oil is really the way to go rather than olive or pistachio oil. I added quite a bit of lemon juice to the pistachio butter and to the beets which helped to perk things up, but even so the dish was not worth the effort (or the extra calories), especially since we had to shell a cup's worth of pistachios! To be fair, I used raw garlic in the pistachio butter rather than sauteing it, although I'm not sure how much difference that would have made. Oh well. I'd still like to try the variation with roasted carrots and walnut butter. If you love Brussels sprouts, there's no better way to bring out and complement their flavor. If you're not a fan yet, be prepared to be surprised. Really good winter recipe. I used a half of a green cabbage along with a can of drained, petite diced tomatoes and kept the rest of the measurements the same. This was a tasty way to spice up roasted cauliflower. I used chili sauce (one jar equaled a cup) because I had some to use and was low on catsup. Would make again. Delicious, and a nice departure from my usual approaches to cooking greens. I love that the orange peel is included here, but I did find it to be a little too much -- I think next time I'll use the peel from only about half the orange. I used half the recommended sugar and that seemed plenty. Also reduced the vinegar a bit and added it at the end, so it had a chance to mingle more with the greens instead of being taken up by the oranges and shallots. Easy and tasty, fun new use for corn. Made with a side sauce of cukes and onion in sweet chili sauce (as for Tod Mun). Added sauted onions, finished with browned bread crumbs, omitted lemon juice. I like this quite well. R did not like onions. Made in advance for a brunch. Lovely. Needs watching but total time not too long. Good and easy. I think this was my first time making home fries. Made this to use up leftover coconut milk and spinach, and we liked it! (I did skip the garlic as I always do). De-stemming the spinach took much longer than I expected but I don't think it really needed 30 minutes to cook. Can add other greens. It might be because I added mushrooms that were going to go bad to this, but it came out incredibly oily. Garlic overpowered the coconut taste. Good; fairly quick and easy. The coconut milk and peanut butter sauce with ginger and chiles we grew in the garden worked brilliantly. A great dish. It took a bit longer than 15 minutes to bring the squash to just cooked through in the first part of the cooking. Worth the time peeling and chopping the winter squash from the farmers market. This is a keeper. look forward to trying the other renditions of this dish. Wanted to like this but it was too sour. Like cranberry sauce it probably needed a hefty adddition of sugar. Excellent - summer on a fork. Tried this with plain tamari not dipping sauce sub-recipe, which would be worth trying. Sliced onions in wings, Chinese style, since type of slicing wasn't clear. Not amazing. It was a bit too eggy. I wouldn't make it again. I used this recipe as a base and edited as follows: 1 inch grated ginger, zest of one orange. Omit butter and replace with 1 tbs sesame oil and 1 tbs peanut oil. I served with an Umeboshi Vinegraitte and a sautee of beet greens, edamame, peas, and scallions. Did not have almond milk so substituted 1/4 cup cream and 1/4 tsp almond extract. Added zucchini. This was bland, easy to make. Needed some salt and more zip. Recipe makes a lot. The recipe does work and I think your choice of cheese is key. I used Woodriver Creamery's "Fusion of Cheddar & Gruyere" along with the parmesan and it was not "cheesy" enough for me. Next time I will try a cheddar and if I have time, I will saute the bread crumbs in butter first. His 45 minutes prep time is bang on, but be mindful it is hands-on. Takes about an hour to prep and get into the oven, plus 45 minutes to bake. My sauce didn't go together very well, and the egg kind of cooked on its own. It wasn't pretty, but it tasted good. I would not take this to a party, and I definitely wouldn't make it on a weeknight. I peeled the potatoes and cut them into evenly sized pieces before boiling. Made with brown rice. Didn't add garlic but did add some green onions at the end and a splash of lime. Pretty tasty, but the texture was a bit gummy. Quite good. The lemon adds a bright note that sets this recipe apart from your basic risotto. I had some asparagus I needed to use, so I cut it into bite-size pieces & stirred it with the last addition of broth. I made a version of this tonight - calling it Mexasian Fried Rice. This book gives a great basic recipe to build upon. I used leftover enchilada filling of sautéed chorizo seitan, peppers and onions, left over brown rice, eggs and spinach...plus leftover white wine, jarred minced ginger, soy sauce and sesame oil. The guys wrapped it up in whole wheat tortillas. I ate it in a bowl with some siracha. Everyone liked it - had seconds! Crazy start to the new year! Had this with leeks. It was fantastic. Good but add the green beans just near the end or they overcook. Combined this with the roasted corn (same page), and chopped fresh thyme. Excellent. Served with steamed fresh zucchini and grilled tenderloins. Recipe suggests cheddar or jack; poblano or red bell pepper. This was super easy and my family loved it. Used sweet onions instead of shallot. I served with some roasted sweet potatoes, carrots, and parsnips with rosemary. I liked the pears with white wine variation better than the apples and sherry. Very different from how I would usually treat mung beans. Bright, a bit sweet, unexpected flavors. Very pleasant but just for one meal...I'm not particularly interested in leftovers. That's okay, because this freezes well so I can return to it when I'm ready. This was surprisingly easy to make with already-cooked beans. It was tasty and would make again. Used more beans and tomatoes. Doubled the spices and topped with sour cream. Good basic recipe - I like that it's not too heavy on the tahini. Still experimenting with the additions (cumin, paprika), but the basic hummus is already pretty satisfactory. Ginger is so unexpected and delicious here. I used sweet potato instead of plantain, tasted great. Using a large plantain, 2 birds-eye chilis, and about a dozen fresh curry leaves. I used Eden Foods non-bpa lined canned black beans, which always is my preference for black beans in any recipe, instead of using black dried beans from scratch. This is not a recipe that I would have tried except for using EYB, noting that I had all ingredients on hand. This smelled great as I was putting it together, but had major textural problems. First, the crust, which consisted exclusively of millet and no binding agent, fell apart entirely. Not really surprising. The filling was so goopy that it could not be lifted out of the pie pan in any semblance of a wedge shape, so it ended up looking like a very disembodied and homely casserole. Also, the instructions just say to add salt to taste. I did (1/4 teaspoon to already salted canned beans), and it tasted fine before it went in the oven, but by the time it was cooked it needed a lot more and there was no good way to mix it in. It would have been nice if he had given a ballpark figure. This was delicious... I used barley as the crust and it was great. Will try the other variations. Wow, this was good! The big surprise is this: thinly sliced & sprinkled with sea salt, these tofu pieces are a dead ringer for an artisanal cracker! Can't wait to make another batch & play around with the seasonings. Used this as a base, but added chopped artichoke hearts, 1 zucchini, 1 medium eggplant. For the herbs, used herbs de provence. Used sautee tofu cut into 1 inch strips, rather than larger chunks. Gave the tofu tons of flavor. I've been trying to eat a more plant based diet with mixed results. This recipe may help me turn the corner and stick with it. The meal was absolutely delicious. There are a number of variations to keep this easy recipe interesting. Definitely will make this again! This recipe is awful. Flavorless, with a weird shiny crust. I'm giving this book away, too many duds. Made with rice milk and gf flour. The cornmeal added an interesting dimension but overall just OK. Baby was a fan. Don't last well. These seemed more like biscuits than scones to me. These are good. Needed 3 eggs to bind, not 1! Satifying. Good warm with cocktails. Ugh. We could taste the buttermilk powder as a distinct note and did not like it. I used Saco brand, which I believe is a standard brand. I really like this, and kind of love that buttermilk powder flavor. More importantly, kids practically put their faces into it. My only complaint--and it's not really a complaint--would be that while the consistency is fine for pouring over crisp lettuces like Romaine, it's a little thin for dipping, which is what it's really good for. I'll be trying it with some whole milk/Greek yogurt or maybe sour cream subbed for half of the liquid buttermilk. I think there's a mistake. Doesn't require ginger ale, but rather actual ginger. Good and simple. Benihana's version probably adds a little sugar. Will definitely make this again. This error in the recipe ingredients list has been corrected. Please ensure you click on the "report an error" link at the bottom of each page to notify Eat Your Books about errors, as they may not get picked up in the Notes section. This is amazing sauce. Kids loved it so much they ate the leftovers with chips. Would be good to triple batch and can for later as it was a lengthy process to make. This has been great for making mild curries that my baby can tolerate. Not a bad recipe, but you don't taste the fennel in the slightest. Used buttermilk (not yogurt.) Added a small handful of sugar with dry ingredients, and 1 cup soaked raisins at the end. Cut into 12 triangles. Brushed tops with buttermilk and sprinkled with course sugar. Baked 11 minutes. And it's a perfect example of how the combination of a few simple, but well-chosen ingredients can be transcendent. I really think you're really going to like this one.